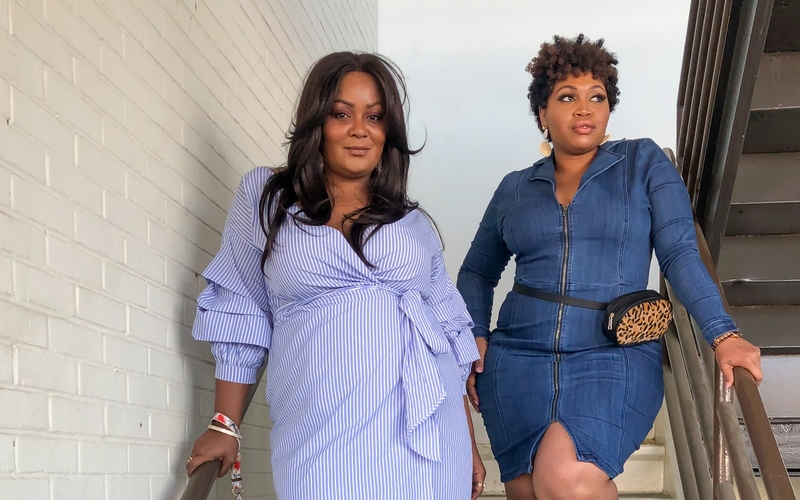 Looking for the perfect spring plus size dress to own for this season? We’ve got a few options from Fashion to Figure that we think you’ll love and a video! This is a sponsored post with Fashion to Figure. Our picks, thoughts, and looks are our own. If we didn’t believe in or love it, we would not share! Ahhh, it is finally spring. The weather is warming up, flowers are blooming, and the birds are happily chirping. We braved this weird winter. But now? 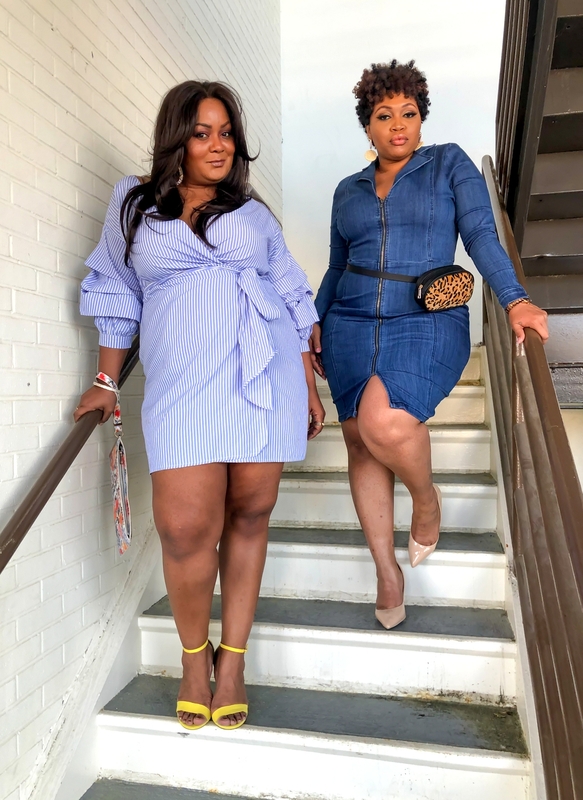 We could NOT wait to switch out our many layers to play in a few new spring picks, more specifically- plus size dresses for spring! With the help of Fashion to Figure, we have found a few options to play in, to get spring fashion started! Have you checked out Fashion to Figure lately? We have shared the news of Fashion to Figure now being under the New York and Company umbrella, but have you been back to see what they are up to? You should! They’ve been serving up the looks, fits, and style that we know you would love- without breaking the bank. Did you ever score anything from the Danielle Brooks x FTF Collab? 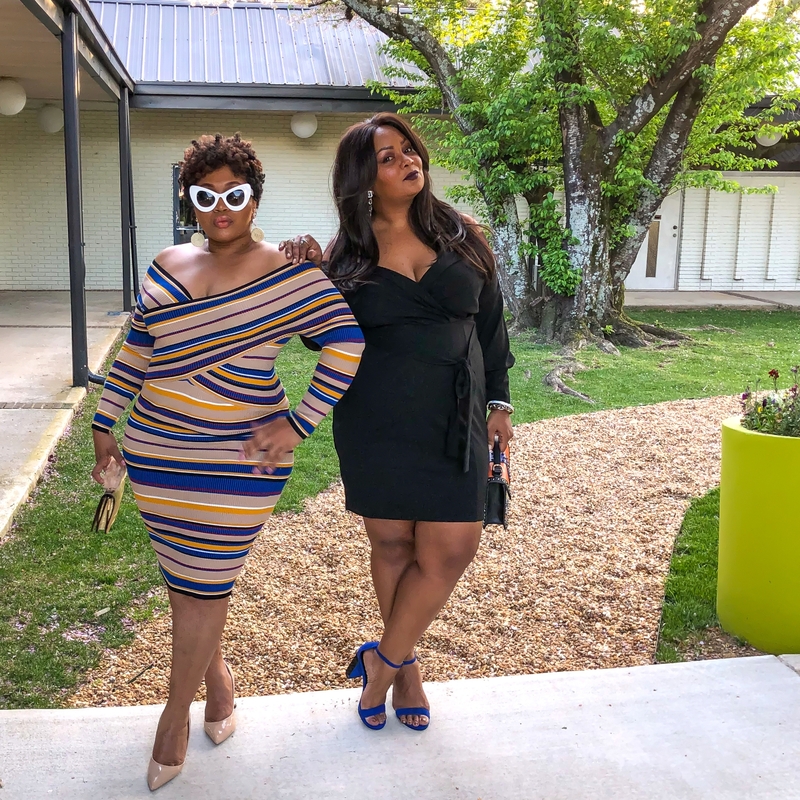 With the help of my friend, Mo McKenzie, we took a spin around town in our newest spring plus size dresses, that we’ve just added to our closet! For this look, we wanted to have a little daytime fun, tap into the denim trend for spring, and be a little playful with our picks. A little denim with a pop of color is fun, right? Marie is wearing the Hollyn Puff-Sleeve Wrap Dress and the White Tear Drop Statement Earrings. Mo is wearing the Denise Denim Zip Bodycon Dress and Animal Print Belted Bag with the Geometric Wicker Dangle Earrings. Our spring evening dress style gets a little bit more sassy and segzy, with our picks. Wanting to show a few plus size cocktail party options, we switched it up a bit. Marie is wearing the Lena Off-Shoulder Belted Bodycon Dress and Mo is wearing the Jodi Off-Shoulder Sweater Dress. Spring is the perfect time to play with colors, texture, and different silhouettes! Whether you want to show a little leg, shoulder, or thigh meat, there are a few options to play with! What do you think of our looks? Do you see a few ways that you could roc these pieces? What I do appreciate about the options we chose is the ability to accessorize them into a whole new vibe. Add sneakers to my blue and white wrap, a bold heel to the denim fitted dress, and you have a whole new look, right?! How would you accessorize these dresses? Want a few more options? No worries! 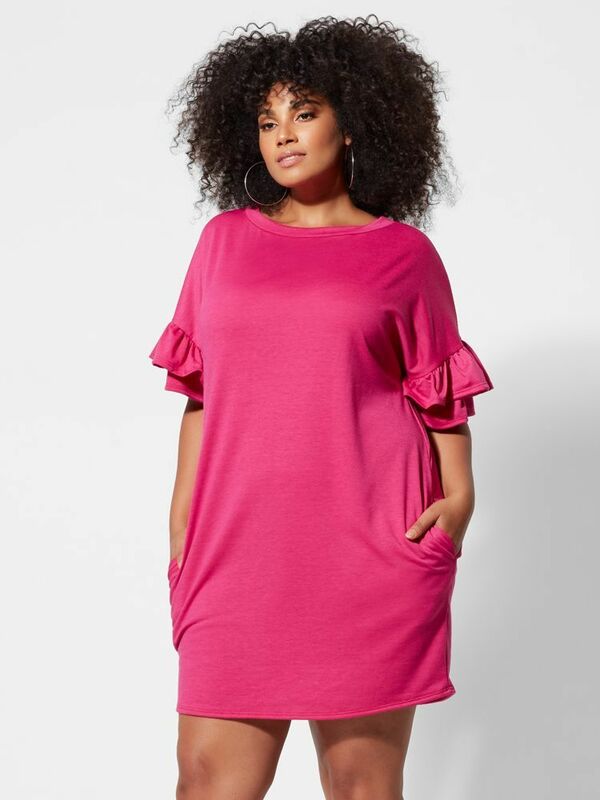 Take a pick at these fun plus size dresses for the spring season below! What do you think of these finds? See something you like that has you curious? We must also share, sizing is generous in some and on point in others. Make sure you check fabrication and the model! As a size 16/18, I find myself in the 1s and sometimes even a 0, in Fashion to Figure sizing! Soooometimes, I may inch to a 2, if I want a more relaxed vibe and fit… sometimes. So, which dresses are you going to rock for the spring season? Have your eye on a few? Not a dress wearer and want a few more options? Make sure you check them out because they have great plus size denim, playful jumpsuits, and are making inroads with their ponte pants! Shout out to Howell Designs for the Video!